When my daughter Lizzie was in prep (in 1998! ), I made a book with her and her friends. It was all about starting school. We talked about different aspects of the first year at school, like the very first day, and making friends, and playing outside, and all the things they learned. I kept that book, and I still have it today. 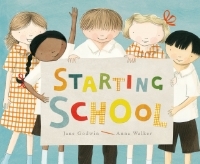 So when Anna and I came to make a book about starting school, I got that old book out and our book is loosely based on the one I made with Lizzie and her friends all those years ago.